Dr Donald Chittick was a highly effective and experienced speaker on the topics of origins and Earth history, with a special interest in the first eleven chapters of Genesis. Dr Chittick earned his Ph.D. in Physical Chemistry from Oregon State University. For many years, he served as chairman of the division of Natural Sciences at George Fox University in Oregon. Since 1988, he was an adjunct professor of chemistry at the Institute for Creation Research in the San Diego area. He was Associate Professor of Chemistry at the University of Puget Sound. He also held patents on alternate fuels and in ‘programmed instruction.’ He has traveled and lectured in many countries. 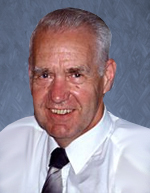 As an inventor, Dr Chittick held several worldwide patents and is active in the area of alternate fuels. He and his family also ran a ministry entitled ‘Creation Compass’. With the help of his wife Donna, for a long time conducting seminars on science and the Bible in churches,schools, and universities, and also speaking internationally. Sadly he died of kidney cancer on 4 December 2016. He has authored The Puzzle of Ancient Man and the highly acclaimed book The Controversy: Roots of the Creation-Evolution Conflict, and also has recorded an audio	cassette series.